Let’s take a deeper look at a powerful healing mantra that is often used in Kundalini Yoga, Ra Ma Da Sa Sa Say So Hung. This mantra taps into the energies of the sun, moon, earth, and the Infinite Spirit. It is an attunement of the self to the Universe, that invokes a deep healing effect. How does that work and what are you actually chanting? 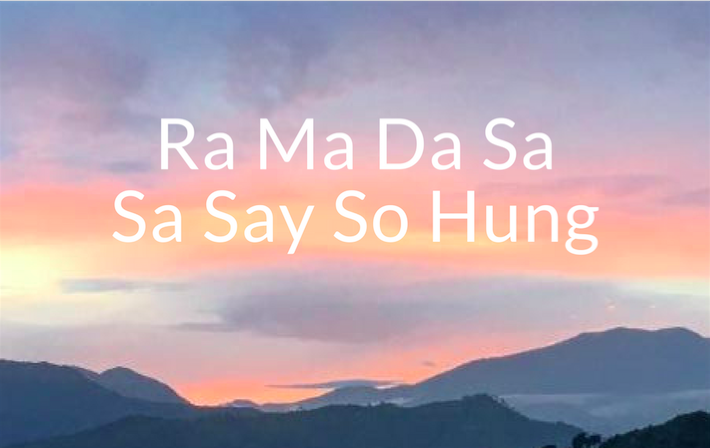 Ra Ma Da Sa Sa Say So Hung are eight sounds that stimulate the Kundalini flow in the central channel of the spine (sushmuna). This invokes healing and has an energizing effect upon our neurological and endocrine systems. This new level of energy in the body can give a metabolic adjustment. The combination of these primordial sounds together could be translated into its essential meaning ‘I am thou’ or ‘The service of God is within me’. The Siri Gaitri Mantra, as this mantra is also called is a way of raising your vibration to the frequency of Divine Healing. It resonates with the universal healing frequency and captures the radiant healing energy of the Cosmos as a gem captures the light of the sun. It gives healing and awareness and helps you move towards a neutral presence since the sounds of this mantra balance the five zones of the left and right hemisphere of the brain which in turn activates the neutral mind. SA; Impersonal Infinity. The cosmos in all of its open dimensions. This part of the mantra pulls the healing vibration into the physical plane. You ascend and expand from earth (Ra Ma Da) towards ether (Sa Say So Hung) in the second part. Sa is the link word. Then you repeat the word Sa, this is a turning point in the mantra. SAY; It is personal, the embodiment of SA, the totality of experience. Chanting it is a way of honoring and feeling the all-encompassing Thou. SO; Personal sense of merger and identity, So is a vibration of merger. HUNG; The infinite, vibrating and real. It is the essence of creation. When you chant So Hung together it means ‘I am Thou’. In this second part of the mantra you pull the energy of Infinity into you, interweaving the qualities of the highest most subtle ether with the dense element of earth. The power of this mantra comes from its ability to connect earth and ether. When you put the eight sounds together it gives us Ram Das → Ra Ma Da Sa = RaM(a) DaS(a). The name Ram Das literally translates as “God’s Servant” but also refers to Guru Ram Das, an actual guru living in India the the 16th century who was known for his humility and healing abilities. By chanting these sounds besides invoking the healing energy of Guru Ram Das you also open your heart for humility. Healing and awareness, humility and neutrality, a perfect combination of qualities that help you rise above your habits and conditioning, to be and feel your exalted self, liberating yourself from the weight of the past and choosing a better option each and every moment and thus creating a future that resonates with the true calling of your soul, your destiny and purpose for being here on planet earth. We are sharing a beautiful Kundalini Yoga Meditation video with this Kundalini Yoga mantra on our Practice page.